NYC subway gunk: What's That Thing? 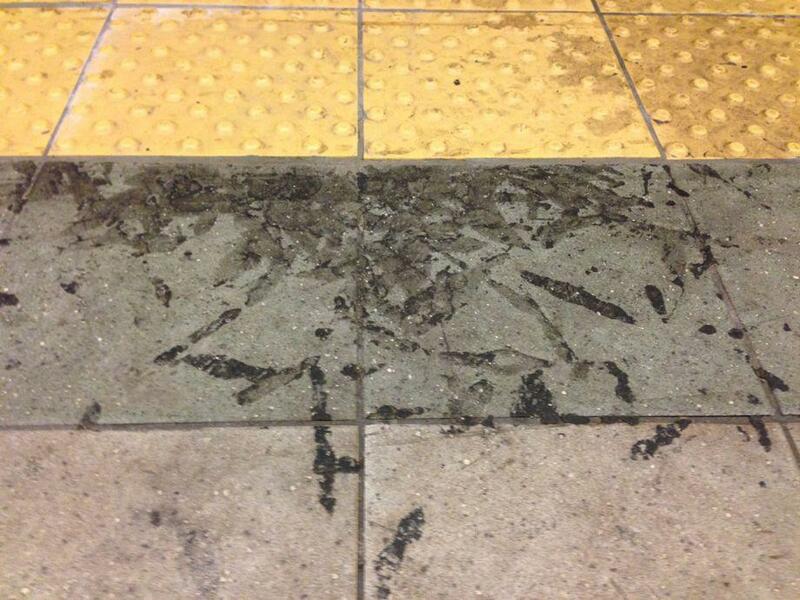 Unsightly pile of gunk on a NYC subway platform. 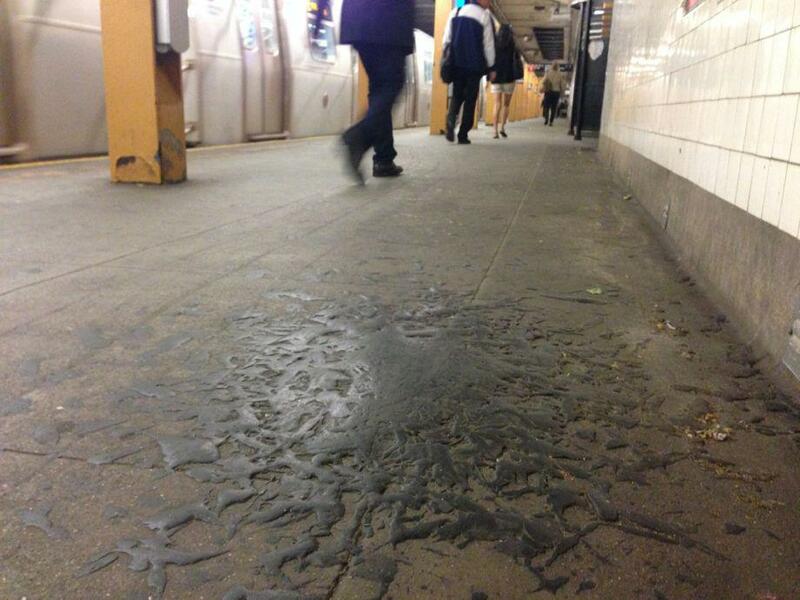 Take a look at that pile of gunk above, one of many similar accumulations found on subway platforms in New York City. What is it? The spoor of some Chewbacca-like, subway-surfing urban Sasquatch? The first worrying, basaltic flickers of some Pompeii-caliber volcanism? A new sculpture by Lynda Benglis? More gunk on a NYC subway platform. Next I turned to Sam Schwartz (aka “Gridlock Sam”) figuring what he and his staff don’t know about public transportation in New York City isn’t worth knowing, let alone stepping around. Schwartz and Harris Schechtman, director of transit planning at Schwartz’s firm, were puzzled but intrigued, and started their own informal investigation. Eventually the MTA’s helpful Marisa Baldeo put me in touch with Branko Kleva, assistant chief of the Division of Stations for NYC Transit, who told me that what I call UGAs are what he calls tar or mastic (Greek, via Latin and Middle English, for “gum”; think “masticate”). Mastic is used to seal and waterproof the tunnel structures. When the mastic warms up, especially in summer—either from the heat outdoors, or the heat that accumulates on subway platforms (much of it caused by the air conditioning inside the subway cars)—it can start to flow and drip down from the roof of the tunnel onto the platforms below. In fact, you can often see stalactites (Greek: “that which drips”) of mastic forming on beams or structures right above the platform areas where a UGA has accumulated. 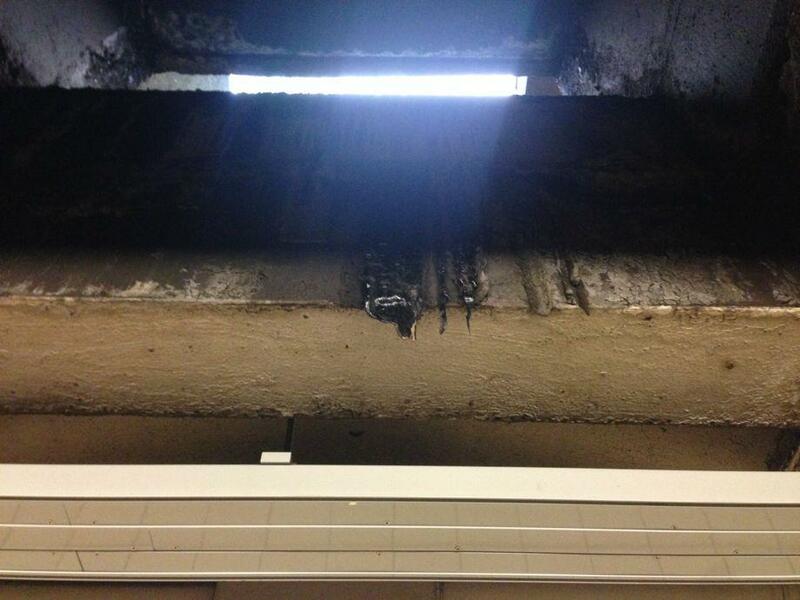 Stalactites of gunk forming on beams above a NYC subway platform. I asked Kleva if these sealant leaks were related to the water you sometimes see pouring out of the ceilings of subway stations, especially in heavy rain. “Not really,” Kleva explained. “Both water leaks and mastic find their way into the system through whatever cracks or pores exist in the concrete.” Rain comes “through areas where waterproofing has been compromised by age or wear and tear.” Mastic, in contrast, “tends to seal the cracks” it moves through. What’s the future of UGAs? Kleva points out that new subway tunnels use new, different kinds of sealants that are less likely to form UGAs. But repairing older tunnels is prohibitively expensive. While small repairs can be undertaken from inside the tunnel, it’s typically only when the street is dug up for another reason that the tunnel is comprehensively resealed. “Whenever we open up the street, we install new waterproofing,” he told me. Global warming will surely mean—in addition to scorched croplands and rising seas—more UGAs. For now the only way to deal with them, says Kleva, is to “scrape them off, or powerwash them”—and perhaps put a drip pan in to stop new formations. It’s easy to be cynical about the cleanliness of the subway, but in fact when I returned to the location of one UGA to take more photographs, it had been carefully and almost entirely removed. 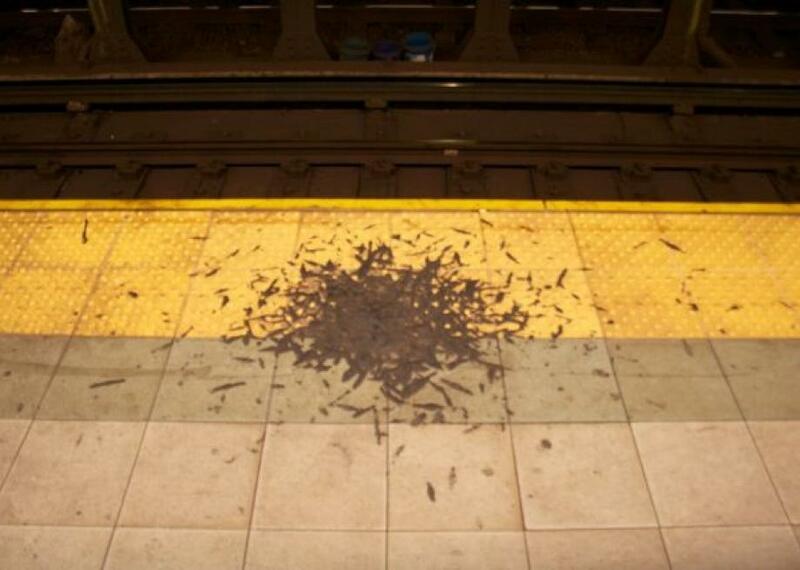 Undisturbed pile of gunk on a NYC subway platform. 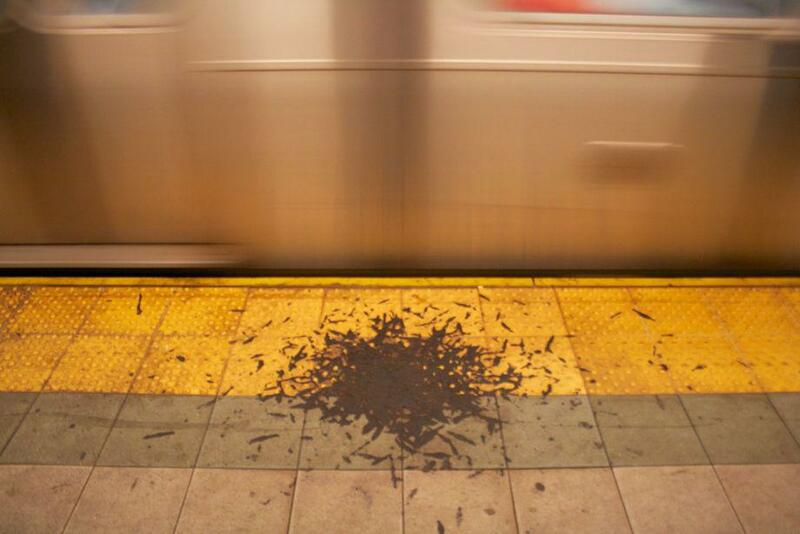 Pile of gunk on a NYC subway after clean-up. I was almost sad to see it gone. Sure, UGAs are nasty. But they’re kinda cool, too. They have both a sands-through-the-hourglass quality (“Like the melting tar that drips from the roof of the subway, so are the days …”) and the sense of an urban environment that is flowing on timescales a bit more geologic than a typical New York minute. UGAs also recall the famous pitch drop experiments (here’s a video of a moment 69 years in the making). 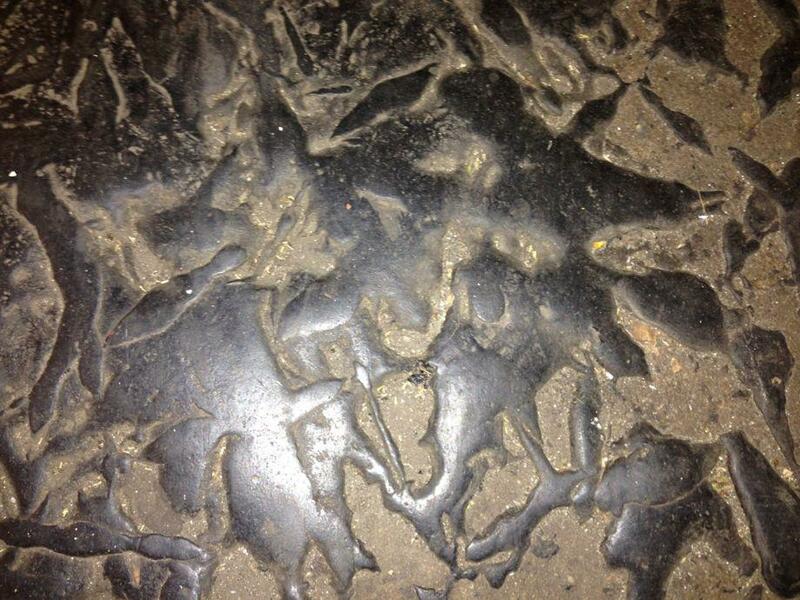 Close-up of NYC subway platform gunk. See something out there—or up there, melting through the ceiling—and wonder what it is? Send a picture or a description to whatisthat@markvr.com.